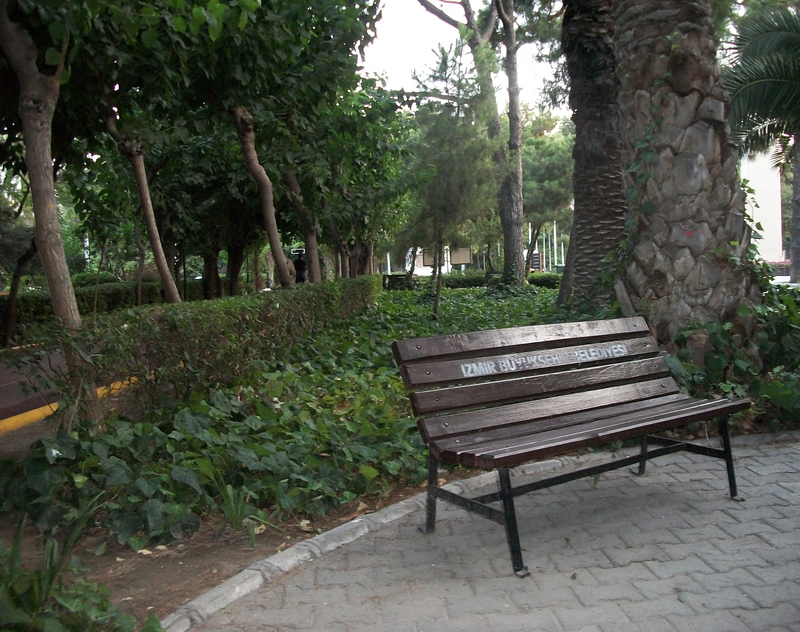 The pair meets in the Kültürpark, a space filled with palm trees, joggers, idle folks napping on benches, doing Sudoku on benches, staring into space on benches. A grandfather takes his small grandson around the perimeter on a whisper-silent moped so the visitors can only hear their approach by the tiny, growing laughter. A stray cat pauses in the greenery to let a stray dog pass. The pair spots each other. He climbs up from his place under a tree to greet her, to watch from his feet as she passes a bored security guard manning the gate and waits for slow joggers to clear her path to him. She wears an orange scoopneck shirt and her hair wound up in a bun. They hug. They hug with their torsos together, but then lean back from each other while still holding on–no kissing, no lingering close–so it is hard to gauge their relationship. They pat each other. He on her lower back five times with both hands, she on his shoulders four times, then he on her back again four times. 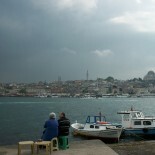 They sit and chat as the heat of the day lifts, as a cool breeze finds its way from the water. And they sit with a distance between them, but still close. They let on their pleasure at being in the same place, but not much more. They rest their hands on their knees. The officer watches them between scuffing his shoes on the cement and glancing at the gate he’s supposed to be guarding. He stretches, twists at the waist, then looks back again at the two rather boring people under the tree, behaving themselves immensely. Just the greenery, not the scenery. I protect my strangers. A well written, visual, and pleasantly descriptive journey. It brings to mind for me the many small things happening in the periphery of our lives while we’re busy paying attention to the things that don’t really matter, or do, but crowd out everything else. I hope that this author self-publishes an ebook. It would be successful. As someone with 16 titles under my name, I humbly believe I can spot a talented wordsmith when I read one. I certainly agree, especially in regard to the importance and beauty in documenting events on the periphery of life. Very nice! Thanks, Damien and Ed. The blog project has been a great way for me to get the details out of my notebooks and to share them. I appreciate you reading my work! That’s a really lovely moment in time. I love that it was something so small and ordinary that it was easy to miss. I’m glad I have deadlines or I might not have watched the scene myself! publish! 🙂 this was yet another splendid post. Each one a story in itself. One surpassing the next. Yes, there is snow on the ground, but is it too early to be thinking of being able to sit in the park? In grass? To savor the day? “Behaving themselves immensely.” I love that phrase! 🙂 *Beam! * Thanks! That was my favorite as well. “A stray cat pauses in the greenery to let a stray dog pass.” chuckle. I brief moment beautifully described. This entry was posted on August 10, 2012 by thenicethingaboutstrangers in Europe, Fitness, Happiness, Travel and tagged Izmir, Kulturpark, love, palm trees, picnic, security, stray cats, stray dogs, tourists, Turkey.